The Montessori Spooning with a Ladle activity is easy to make and three-year-olds love it! Materials: a small ladle, two small bowls, a tray, and a sponge (or face cloth). 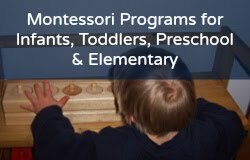 Most Montessori classrooms make each piece of a practical life activity the same color, but if you don't have matching pieces, that is OK, too. Food coloring optional. You will need to add water to the activity as needed. Some teachers like to use food coloring in the water activities. If you choose to use food coloring, I find it helpful to save several large water bottles, re fill them with water, and make each bottle of water a different color, then use them as needed. 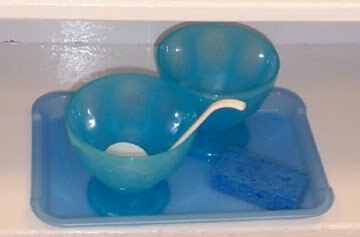 You may want to make this water activity for outside, or in your kitchen. 1. Spoon/ladle from left to right, then right to left. 2. Sponge up any spills, or use a small towel cloth. 3. Ask child to have a turn. You can substitute water with beans, pasta shells, or rice, but make sure it is easy (not too hard) for the child to pick up if spilled. You can also make a spooning work with a Chinese soup spoon, which is more challenging, or a baby spoon.